The den was a HUGE project in our house. 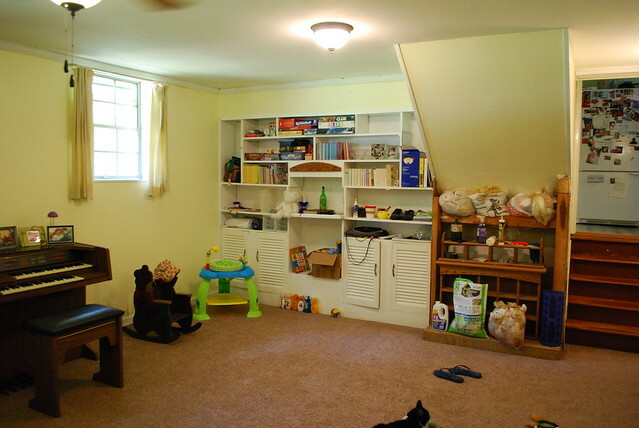 My plan for the room was to make an area that was 100% kid safe and child proofed. In the future I envision getting something like a sectional with a hide-a-bed for slumber parties and overnight guests (after we have more kids and the guest room becomes just a bedroom). One thing I love is that it is only a few steps down from the kitchen, so I can keep an eye on the kids while cooking dinner. 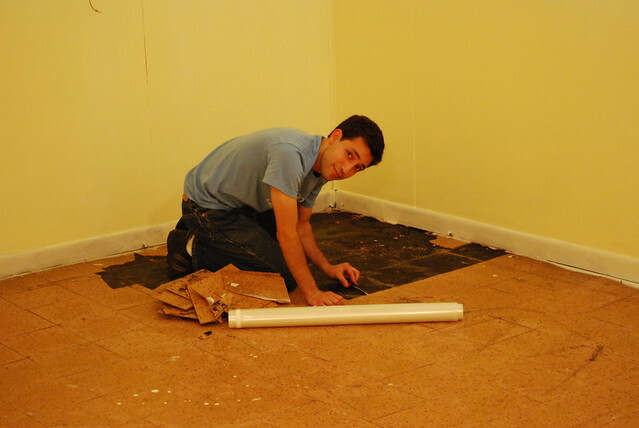 The carpet was the first to go – it was damp and smelled horrible. 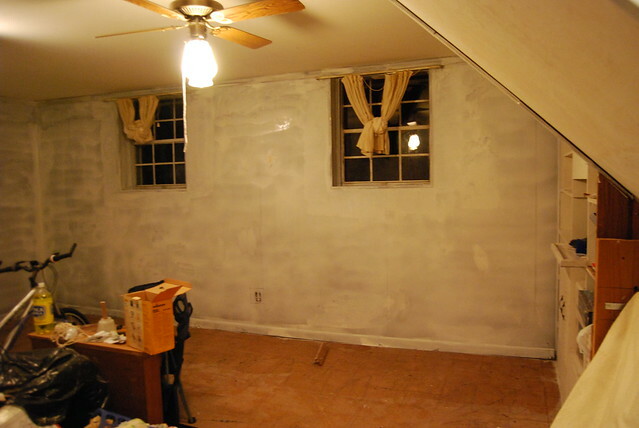 It became a sort of junk room for about 6 months when my sister came down for a week and helped us paint. It took 4 coats of paint to cover the dark paneling! We put 2 coats of Kilz on it to help with the mustiness and possible mildew in the room. The room definitely had a basement feel to it. 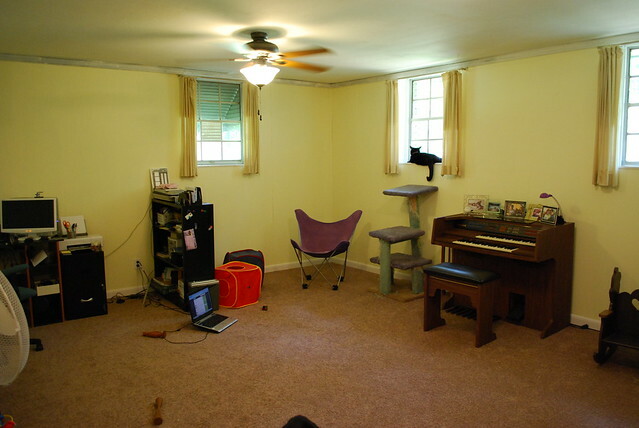 We then put on a few coats of the same yellow we used throughout the house. We also ripped out the fake fireplace, and hope to put some storage shelves there. That’s Paul’s project, someday. I had originally thought I wouldn’t worry too much about the built-in shelves, but when I pulled out the white paint I thought I’d just go ahead and give them a nice coat. I’m glad I did! I didn’t realize how disgusting those shelves were! I washed them, too (before painting), and they look so much better. I wish I’d gotten a picture of a shelf half painted so you could see how gross they were! After painting, we waited another few months until we had the money to put in carpet. That became an adventure in of itself! We finally got the carpet in, and so far we have been loving it! 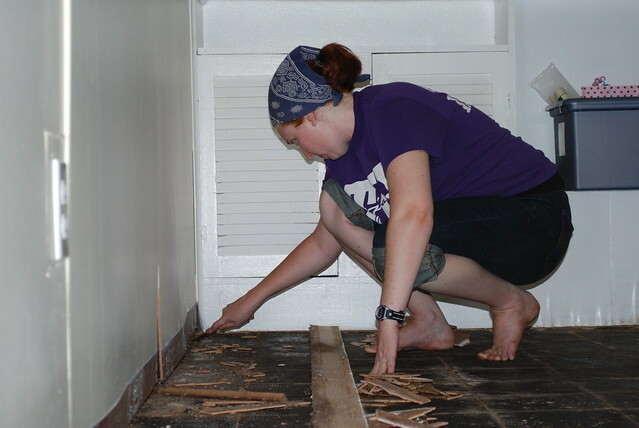 We also replaced all the baseboards. We also did a few other smaller things: we replaced all the plugs in the room, because the old ones were brown (to match the paneling). There was an A/C vent and an air return that we got covers for – the return was a different size than I guess they make now, because getting a cover for it was really hard! I ended up having to buy one a few inches too big but it works. Little things like that really help finish a room! I took out the accordion door that went from the den to the laundry room. Once the room was painted, the brown door looked a little weird. Also it made it impossible to put a baby gate in the door way, and the door itself wouldn’t latch. I looked into other types of doors and decided our best bet was to just leave it open, even though now you can see the laundry area. We replaced the ceiling light and ceiling fan. The old lights were mismatched and outdated, and the fan was too small for the room. So, I picked up something that looked nicer and have been pretty happy. However, I will say, I think it might be worth paying more for a nicer ceiling fan. We bought the cheapest we could find and I definitely notice a difference between this fan and the ones upstairs in our bedrooms (that came with the house). Fans are just so expensive, though! 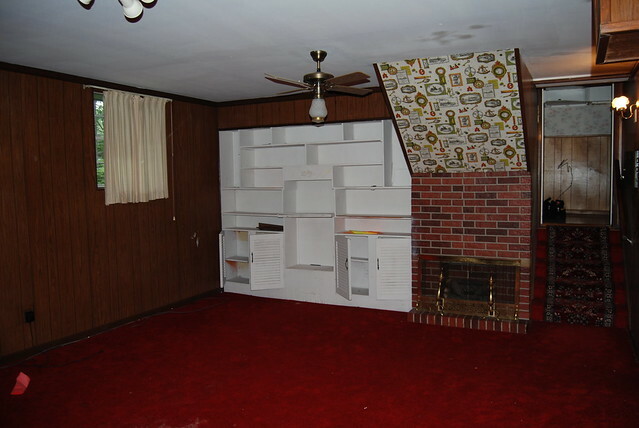 As you can see we have learned a lot about houses from this room alone! 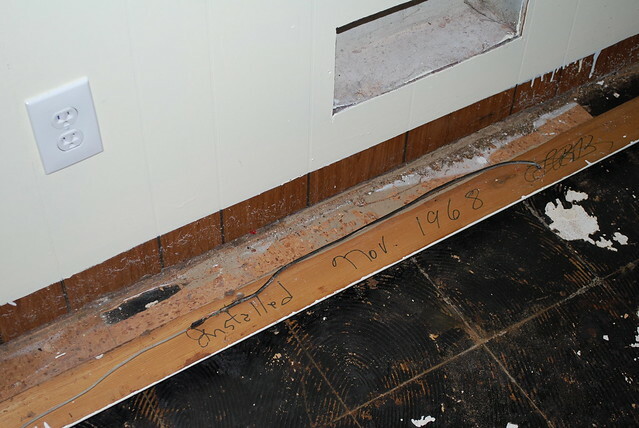 A year ago, we did not know anything about carpet, tiles, sealing cement floors, tree roots, replacing electrical outlets, replacing lights and fans, and baseboards. The other thing I want to tackle are the window coverings. These are kind of ugly, but I’m not really sure what to replace them with. The windows are very close to the top of the room because of this part of the house being partially underground, so I think the normal panel curtains look a little silly. I don’t want curtains that go to the floor because of it being a playroom. Perhaps blinds? I’m still thinking about it. In the meantime, I’m really happy with how this room has turned out! 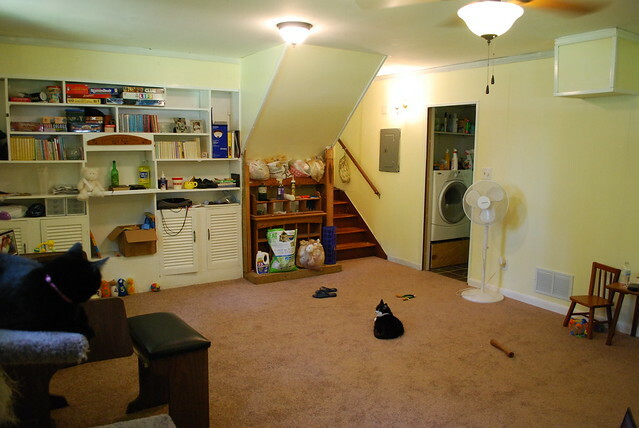 A great space for a family.